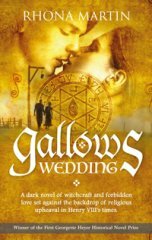 Subtitle A dark novel of witchcraft and forbidden love set against the backdrop of religious upheaval in Henry VIII's times. A strange, haunting story of two ill-starred lovers, set against the backdrop of the religious upheaval of Henry VIII's time. Hazel, a peasant girl marked by the witches' brand and a dangerous beauty, loves Black John, an outlaw and aristocrat, whom she rescues from the gallows. Rhona Martin was born in London. Her father came from South Dakota, and her mother was a descendant of the Bishop John Hooper who was burnt at the stake for his religious beliefs by 'Bloody' Queen Mary. "Extremely accomplished by any standard, but astonishing as a debut. . .
A very gripping, very well written historical fiction novel that takes us back to religious upheaval in Henry VIII's time. Survival, tension, romance and tragedy all unfold to keep you reading on. I could not put the book down! Excellent read and a very worthy winner!